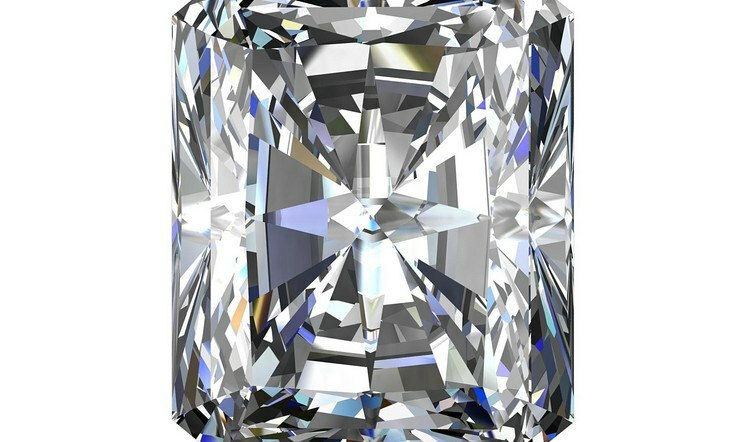 With a shimmering 70 facet cut, the radiant diamond cut is considered to be one of the more brilliant diamond shapes. Even though it has only been in the diamond community for thirty-nine years, this diamond cut has managed to gain increasing popularity in a short amount of time. Radiant diamond cuts are one of the top ten most common diamond cuts and are often used for engagement and wedding rings. In 1977, Henry Grossbard designed the cut with the goal of combining the best elements of the emerald cut and the round brilliant cut into one diamond cut. After working for thirty years as a master diamond cutter, Grossbard wanted to create a diamond cut that would unleash the full potential of a diamond’s brilliance. His idea was to feature the long elegant shape of an emerald cut with the many fiery facets of the round brilliant cut. Though radiant diamond cuts are known for their rectangular, emerald-like shape, they can also have a more square-like shape resembling a cushion cut diamond. However, there’s no mistaking the difference between these two cuts as the radiant cut diamond has noticeably many more facets and significant sparkle. With its undeniable beauty, the radiant diamond cut is popular among famous faces. As an engagement ring, the radiant diamond cut makes a statement to flashing photographers. Drew Barrymore – Though she’s had her fair share of engagements, Drew Barrymore’s engagement ring from Will Kopelman was one of a kind! Will Kopelman gave Drew a 4-carat colorless radiant cut diamond in a French-set band covered with diamonds. Jennifer Lopez – Back when “Bennifer” was in it’s prime, Ben Affleck bought J-Lo a rare pink radiant cut that had an estimated worth of 2.5 million. At 6.1 carats, the ring was as much a point of discussion as was their relationship. Khloe Kardashian – Lamar Odom proposed to Khloe Kardashian with a 12.5-carat radiant stunner. Megan Fox – Just hours after Brian Austin Green proposed to Megan Fox, she lost the ring in the sand on a beach in Hawaii! To replace the lost gem, he brought her a 3-carat platinum radiant cut diamond ring. Engagement Ring – One of the perks of the radiant cut is that it’s rectangular shape makes including accent diamonds extremely easy and aesthetically pleasing on a wedding or engagement band. Two popular radiant cut engagement rings featured on Brilliance are the Trellis Three Radiant Diamond Ring and the Custom Yellow Gold Radiant Engagement Ring. Square Radiant – For a radiant cut diamond that has a more square shape than a rectangular shape, solitaire earrings are a great way to add some sparkle and glisten to your look. Rectangular Radiant – Because of their length, rectangular radiant cut diamonds look excellent hanging from your neck. You can try a longer chain or shorter; either way a radiant cut will make an eye-capturing accessory. Many people interested in square-shaped diamonds may turn to the princess cut for their jewellery. However, the radiant diamond cut is a shape for real jewelry aficionados who want a scintillating square-shaped diamond. Though the radiant cut is one of the newer diamond cut shapes, it’s brilliance is sure to capture the attention of others.